The Microsoft Graph API now supports Microsoft Intune with specific APIs and permission roles. The Microsoft Graph API uses Azure Active Directory (Azure AD) for authentication and access control. 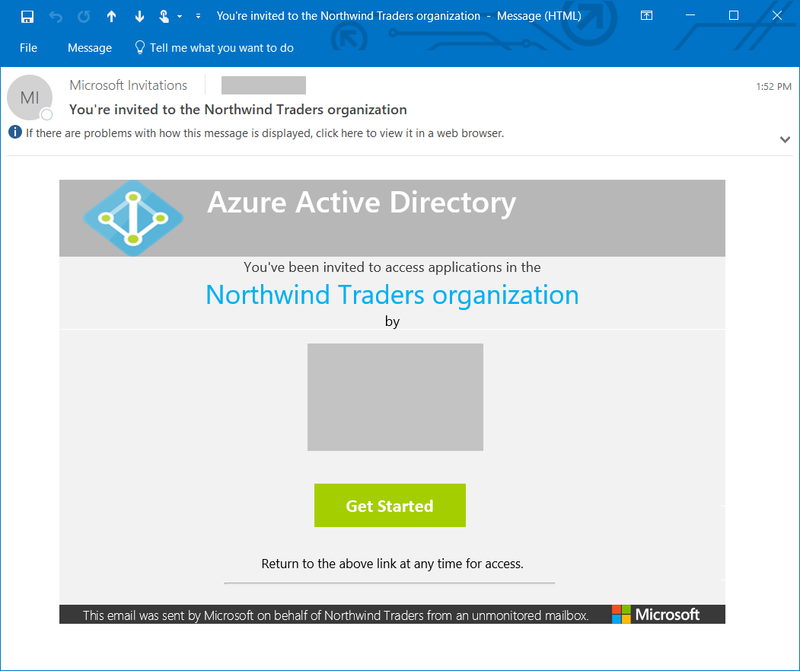 Permission to call Azure AD and the Microsoft Graph APIs. Permission scopes relevant to the specific application tasks. Permission to access the Azure AD tenant associated with the application. Role permissions required to support the application permission scopes. The end user to grant permission to the app to perform applications tasks for their Azure tenant. Shows how to register an application with access to the Microsoft Graph API and relevant permission roles. Describes the Intune API permission roles. Provides Intune API authentication examples for C# and PowerShell. Describes how to support multiple tenants. Sign into the Azure portal using administrative credentials. A tenant user account with the Users can register applications setting enabled. 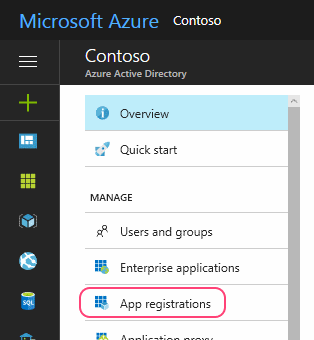 From the menu, choose Azure Active Directory > App Registrations. A Name for the application (displayed when users sign in). The Application type and Redirect URI values. These vary according to your requirements. 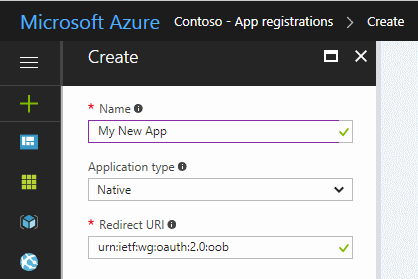 For example, if you're using an Azure AD Authentication Library (ADAL), set Application Type to Native and Redirect URI to urn:ietf:wg:oauth:2.0:oob. To learn more, see Authentication Scenarios for Azure AD. Note the Application ID value. Choose Settings > API access > Required permissions. From the Required Permissions blade, choose Add > Add API access > Select an API. From the Select an API blade, choose Microsoft Graph > Select. The Enable access blade opens and lists permission scopes available to your application. Choose the roles required for your app by placing a checkmark to the left of the relevant names. To learn about specific Intune permission scopes, see Intune permission scopes. 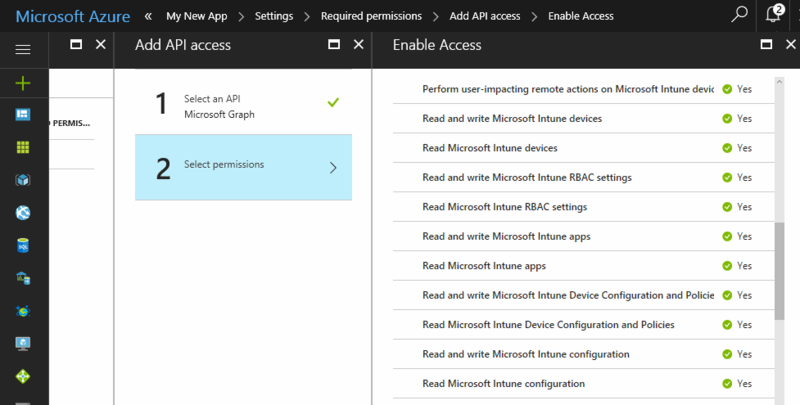 To learn about other Graph API permission scopes, see Microsoft Graph permissions reference. For best results, choose the fewest roles needed to implement your application. When finished, choose Select and Done to save you changes. Choose to grant permission for all tenant accounts to use the app without providing credentials. To do so, choose Grant permissions and accept the confirmation prompt. When you run the application for the first time, you're prompted to grant the app permission to perform the selected roles. Choose Manifest from the application blade, which opens the Edit Manifest blade. Change the value of the availableToOtherTenants setting to true. Azure AD and Microsoft Graph use permission scopes to control access to corporate resources. Permission scopes (also called the OAuth scopes) control access to specific Intune entities and their properties. This section summarizes the permission scopes for Intune API features. When you grant permission to Microsoft Graph, you can specify the following scopes to control access to Intune features: The following table summarizes the Intune API permission scopes. The first column shows the name of the feature as displayed in the Azure portal and the second column provides the permission scope name. The table lists the settings as they appear in the Azure portal. The following sections describe the scopes in alphabetical order. At this time, all Intune permission scopes require administrator access. This means you need corresponding credentials when running apps or scripts that access Intune API resources. This section shows how to incorporate Azure AD into your C# and PowerShell projects. In each example, you'll need to specify an application ID that has at least the DeviceManagementManagedDevices.Read.All permission scope (discussed earlier). You've updated the application ID to one authorized to use the Microsoft Graph API and the DeviceManagementManagedDevices.Read.All permission scope. Your tenant credentials support administrative functions. Your code is similar to the displayed samples. This example shows how to use C# to retrieve a list of devices associated with your Intune account. 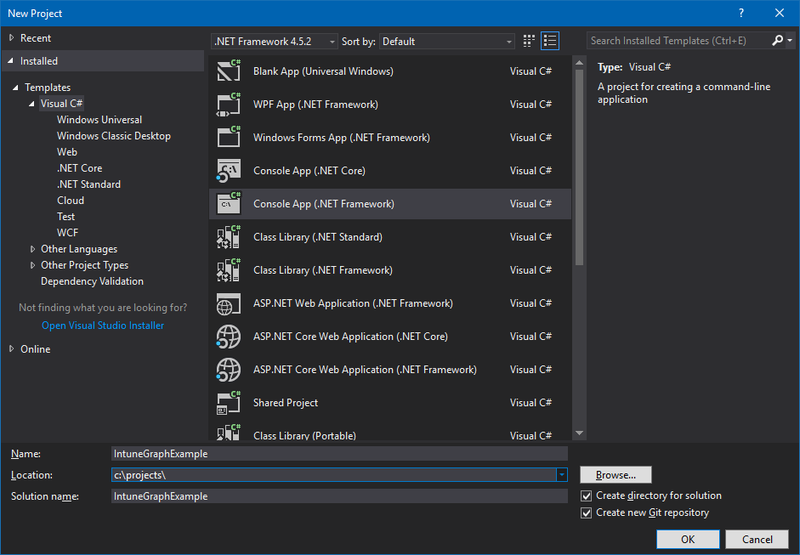 Start Visual Studio and then create a new Visual C# Console app (.NET Framework) project. Enter a name for your project and provide other details as desired. Use the Solution Explorer to add the Microsoft ADAL NuGet package to the project. 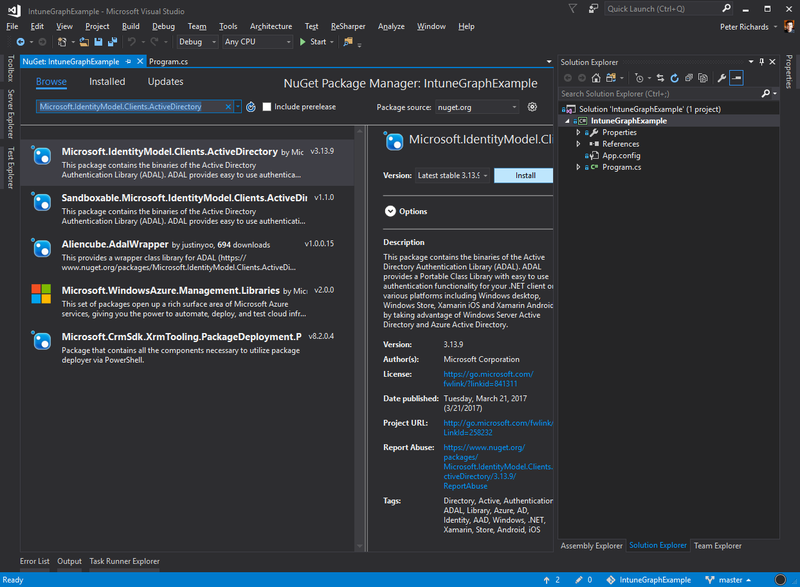 Choose Manage NuGet Packages… > Browse. Select Microsoft.IdentityModel.Clients.ActiveDirectory and then choose Install. Remember to change the value of application_ID to match one granted at least the DeviceManagementManagedDevices.Read.All permission scope, as described earlier. When you first run your program, you should receive two prompts. The first requests your credentials and the second grants permissions for the managedDevices request. The following PowerShell script uses the AzureAD PowerShell module for authentication. To learn more, see Azure Active Directory PowerShell Version 2 and the Intune PowerShell examples. In this example, update the value of $clientID to match a valid application ID. $clientId = "<Your Application ID>"
$authToken = Get-AuthToken -User "<Your AAD Username>"
If your organization supports organizations with their own Azure AD tenants, you may want to permit your clients to use your application with their respective tenants. Verify that the client account exists in the target Azure AD tenant. Verify that your tenant account allows users to register applications (see User settings). Establish a relationship between each tenant. a. Use the Microsoft Partner Center to define a relationship with your client and their email address. b. Invite the user to become a guest of your tenant. Choose Add a guest user from the Quick tasks panel. 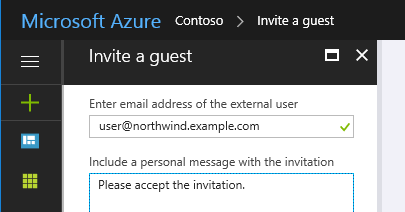 Enter the client's email address and (optionally) add a personalized message for the invite. This sends an invite to the user. The user needs to choose the Get Started link to accept your invitation. When the relationship is established (or your invitation has been accepted), add the user account to the Directory role. Remember to add the user to other roles as needed. For example, to allow the user to manage Intune settings, they need to be either a Global Administrator or an Intune Service administrator. Use https://admin.microsoft.com to assign an Intune license to your user account. Update application code to authenticate to the client's Azure AD tenant domain, rather than your own. For example, suppose your tenant domain is contosopartner.onmicrosoft.com and your client's tenant domain is northwind.onmicrosoft.com, you would update your code to authenticate to your client's tenant.